I discovered Meat Loaf when “I’d Do Anything For Love (But I Won’t Do That)” became a hit and Bat out of Hell II became the first album where I liked every track (arguably a superior sequel too)! I almost went to London to see the culmination of four decades of music history, but when I found out about Toronto that was more affordable so I waited a few more months but I finally saw it this week during previews. The interactive elements of the stage production bring you in immediately. There’s activity on stage before the curtain comes up, and what a shock to have the “Love and Death and the American Guitar” monologue open the show before everyone has even found their seats. Also a jolt to hear it with different inflection than Jim Steinman gave it on Bat II. I’ve heard it spoken exactly one way since 1993. Die Hards have heard it that exact way since Steinman’s 1981 solo album. He never changed it one syllable for Bat II. These are songs I love no matter who is singing them but there is something about seeing a chorus dance along that’s bigger than Meat Leaf and Patti Russo themselves on stage (with the band confined to their instruments). Songs are largely lyrically faithful. They fit the story impeccably simply by choosing the right character to give each lyric. There are occasional pronoun changes and a few new lines, but since the songs were always intended to tell this story, few alterations were necessary. When Strat (Andrew Polec or Benjamin Purkiss in some performances) says “you’ve gotta learn to dance before you learn to crawl” during “All Revved Up With No Place To Go,” I expected more mixing it up but the songs are mostly verbatim, with other lyrics worked into dialogue. Fans of “Everything Louder Than Everything Else” like me can at least be happy the “Wasted Youth” part is incorporated into the show. Another missing Meat Loaf song plays on the radio. I won’t spoil which. Turning songs like “Two out of Three Ain’t Bad” into duets is also dynamic. Danielle Steers is a Darlene Love type which gives “Two Out of Three” a poignant energy and it’s incredible when she sings the Cher part of “Dead Ringer For Love.” Geovanni Spano and Patrick Sullivan turn my favorite son “Out of the Frying Pan” into a fun buddy anthem as Ledoux and Blake respectively. Songs that modify the classic arrangement are powerful covers like we’ve never heard before: an up tempo “For Crying Out Loud” makes it a happy rock song, and a melancholic “Rock n Roll Dreams Come Through” a beautiful tragedy. It is really hard to resist singing along, but that would be rude. There are people putting on a live show here. 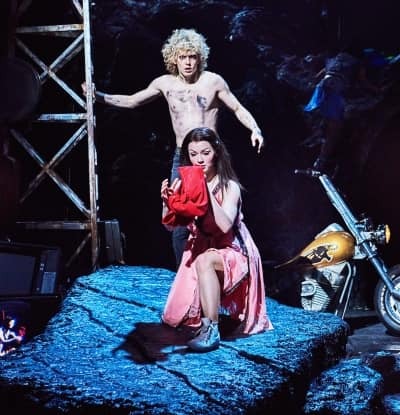 Bat Out of Hell weaves the songs into the perfect story for this kind of nostalgic teen angst looking back from the future the songs always had. In the dystopian future, The Lost are frozen at the age of 18. Strat falls in love with Raven (Christina Bennington), the daughter of dictator Falco (Rob Fowler). Will she freeze? We’ll never know. The play ends before her 19th birthday. One freezer, Tink (Aran MacRae), was frozen younger and that’s tragic because he’s not even at the good part of being teenaged. They don’t say exactly at what age Tink froze. It could be as close as 16 but I’m thinking younger, because 16 is still pretty cool and hormonal. I’m thinking 12, just before he could develop into the lovesexed prowlers all the other Lost are. Other important characters: Zahara (Steers) is a freezer who tries to help bring Strat and Raven together. She has a romance subplot with Jagwire (Billy Lewis, Jr.). Falco’s wife Sloan (Sharon Sexton) sort of wants Raven to have a chance at youth that she longs for again herself. The women in Bat Out Of Hell are powerful AF. Every emotion happens instantaneously. Theater is good at broad strokes storytelling. The audience is watching at a distance so everything has to be big enough to see from the back row. The songs are obviously big enough and Bat Out of Hell deals with the kind of love, betrayal and redemption that does just that. The stage itself is astounding. There are motorcycles running back and forth. There is a frigging cave on the stage, so you can guess where that’s going. There’s a triple level pyramid on the right. The first two levels open up for more sets. Level two can be a tiny bit obscured if you’re sitting on the right, but it’s Raven’s bedroom so should be private to an extent. There’s also a video feed blasting a different angle into screens. The videographer is unobtrusive following them on stage. You could say she becomes a character herself but she doesn’t. That’s the point. She’s not a character and it doesn’t bother anyone that she’s on the stage capturing video for other parts of the set. The stage effect for the motorcycle crash blew my mind, the creativity of using the tools of the medium to convey that moment from a song I’ve known by heart for over 20 years. The gag at the end of “Paradise By The Dashboard Light” may be my favorite meta theater joke I’ve ever seen. Costume changes happening on stage are also impressive. I should add, well choreographed disrobing too. If you know songs like “Paradise,” you get it. Act two is more ballad heavy, but it works. We need it by that point. I’ve gotta say I welled up during the double duet of “It’s All Coming Back to Me.” Particularly the portion Sloane and Falco sing. Full disclosure, that was one of my freshman year songs so it really is all coming back to me. In that final act, “You Took the Words Right Out Of My Mouth” and “Anything for Love” are catharses we need, especially when the chorus hits the word “hot!” Thank you to all the singers I didn’t name drop, all the dancers and the band for bringing these songs to life anew. This is what Streets of Fire should have been. Bat Out of Hell is a fantasy world where rock and roll tropes are real. I loved it so much, I’m glad I saw a matinee because I went right back and purchased a ticket for the 8pm show. I would do anything for Bat, and I even did that. I also got to see both Polec and Purkiss in the lead and they were each great! If I lived in Toronto I might’ve waited but I gotta make the most of my one night in Toronto. When it’s over, you know, I hope it tours LA.